A stylish notebook case for your daily travellings around the city, introducing OKION's CityWalker Lite notebook case - A light weight, slimest and stylish case available for notebook PC with upto 15.4" screen. 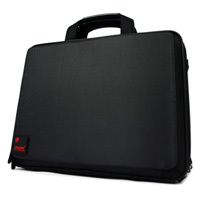 A padded compartment is the heart of this case and it's designed to store securely your laptop while on the road. Accompany the laptop compartment is a large size papers compartment for your documents as well as folders. 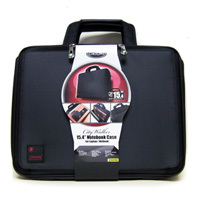 The front workstation includes a holders for business cards, pens, as well as smaller pockets for other mobile gears such as PC peripherals, accessories, and mobile phone. The case is equipped with the luggage strap so that travellers can easily attach this case to the rolling luggage for handy carrying.